By combining rounded curves and the natural aesthetics of real wood, the Wood Tones Series creates a contemporary, sleek look that adds an elegant touch to any desktop. Ideal for any office or home office decor. 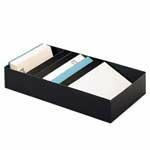 Separate slanted shelves for paper or envelopes; fits all standard desk drawers. 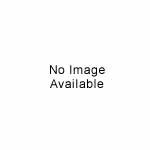 Features section for commonly used No. Contains 20% post-consumer recycled steel. Four popular Post-it dispensers, plus eight compartments for supplies. 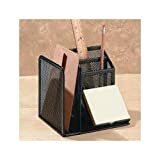 Adjusts from 10-3/8" to 16" wide to fit most drawers. Lift out or slide back for access to drawer contents. 50% post-consumer plastic. 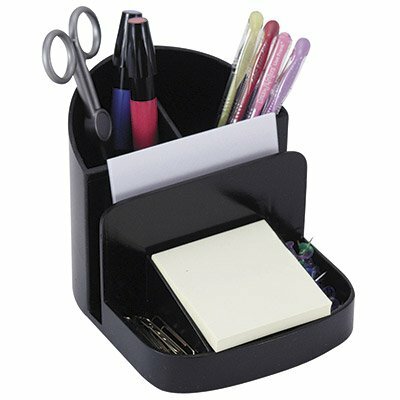 1-5/8"h.
Versatile three-drawer desktop organizer holds letter-size papers with efficiency. Units can be stacked to add storage. 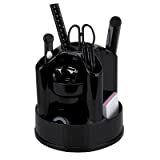 Easy-To-Handle hand grips, drawer stops, and finger hole in bottom assist in retrieving papers. Nine-Compartment trays fit in your desk drawer neatly. Mesh design gives your workspace curb appeal. Adds efficiency, productivity, and a fashion statement to your desktop. 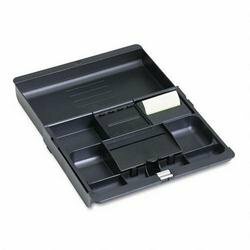 Two compartments for pens and pencils, two side compartments hold pads. Holds 3 x 3 note pads (not included). 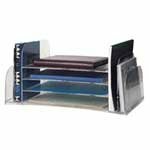 Shelf Savers storage organizers make it easy to keep overhead bins, supply cabinets and closets free of clutter. These innovative cubes, bins, baskets and drawers will help organize supplies and maximize vertical space in shrinking working environments. Get better organized and be more productive - simply mix and match units to create your own modular system. Cube items include metal clips for connecting multiple units. Item CEB40220 comes with tape, scissors, ruler, letter opener, utility knife, staple remover, paper clips, note pad and 4 stick pens. Has room for pens, pencils, sticky notes, letters, clips and more.